You can replace the default StackPanel used as the items panel for a ListBox with any other panel element. Below is an example of displaying some news stories in a DockPanel. We can then create a collection of NewsStory items that we’ll bind to. Notice that we create a spiral pattern by setting consecutive Dock properties to Bottom/Left/Top/Right. We also use the Angle property to rotate every other element. // more entries go here.. 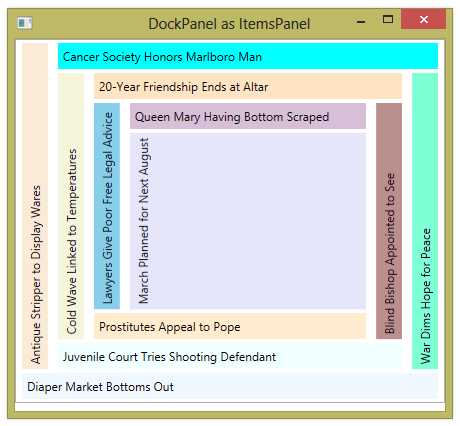 In XAML, we set the ItemContainerStyle to do the docking and specify a DockPanel as the ItemsPanel. Normally, when you use a ListBox, the ListBox itself persists the record of which items are selected. You might also want to persist information about which items are selected within the actual data objects that you’re binding to. You can bind the IsSelected property of each list box item to a boolean property on the data object as shown below. Now, as you select/unselect items, the IsFav property in the corresponding Actor object is set or cleared. Also, when your application starts, the ListBox selection will initially be set to reflect the value of this property. DisplayMemberPath can be set to the name of a property (of type string) on the bound object. The value of that property is then used as the displayed value of each item in the list. 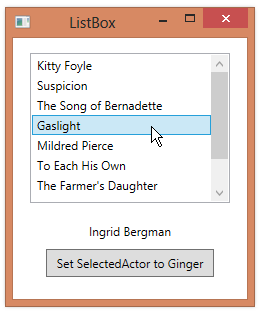 Below, the KnownFor property of an Actor is used to generate the string in the ListBox. 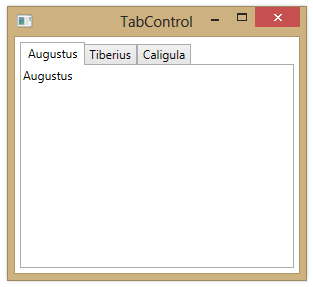 A ListView control contains a collection of items that you can view in different ways. The current view can be set using the View property, which can be set to an instance of a GridView. A GridView is an object that can display the data in columns. 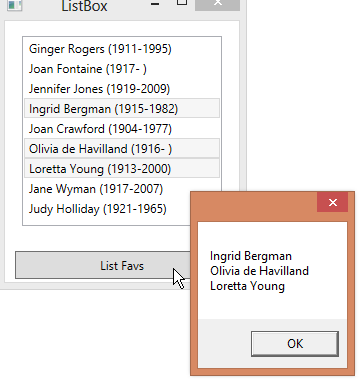 Below is a complete example of a bound ListView that uses a GridView to display its items. The ListView is bound to a collection and the GridView contains GridViewColumn instances, each of which is bound to a property of the items contained in the collection. <Label Content="Ad eundum quo nemo ante iit"
The code-behind for the top-level Window sets the data context and creates the collection. For completeness, here is the implementation of the Person class. Using the ToString method on numeric and date-based types from within your code, the output will reflect the current culture, as stored in the CurrentCulture property of the current thread. 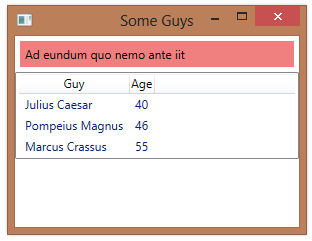 When the data binding mechanism in WPF converts numeric or date-based data to a string, however, it doesn’t automatically use the current culture. Instead, you must set the Language property of the FrameworkElement where the binding is occurring. You typically set this property based on the CurrentCulture property of the current thread. You can set the Language property of the topmost user-interface element, so that all of the other elements inherit the value. Our first attempt to bind elements in a collection to a Grid didn’t work as expected. We set the Grid.Row and Grid.Column properties in the data template, but the items did not show up in the correct row and column. The problem is that when we’re setting the Grid.Row and Grid.Column properties on the Label control in the data template, these Label controls are not direct children of the Grid, so the properties have no effect. 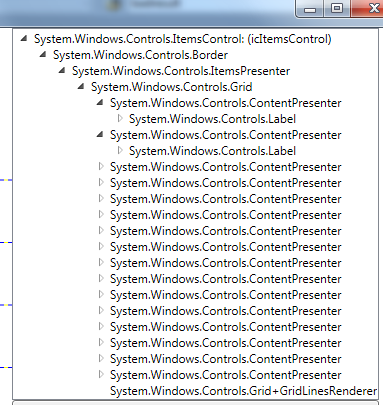 We can look at the visual tree of the ItemsControl to see this. The direct child elements of the Grid are actually instances of a ContentPresenter. What we really want to do is set the value of the Grid.Row and Grid.Column properties on the ContentPresenter, rather than the Label. I’ll show how to do that in the next post.